wifi-rental-japan provides Y!mobile 603HW, which is popular for its high speed. Enjoy High Speed WiFi and Wide Coverage Area. Use advance mode, 4G AXGP signal with unlimited data. Enjoy stable and high speed WiFi while traveling Japan. Use standard mode, 4G LTE signal with data limit of 7GB/month. Don’t forget to change to advance mode when not using! The newest WiFi technology has been adapted to 603HW. Experience super high speed mobile WiFi router. There is no speed limit unless you use 10GB within 3 days. In this case, speed limit is applied from 6:00 p.m. to 1:00 a.m. to avoid congestion. * You will not be able to access to both advance and standard mode after using 7GB/month with standard mode. You will get a package with mobile WiFi router, USB cable, AC adapter, pouch, instruction, and pre-paid return envelope. There is no additional fee for shipment. 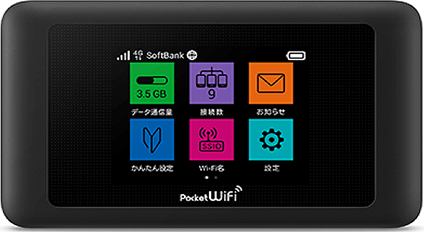 JPY 900 includes every fee required to rent a pocket WiFi including tax. Save your travel budget with Y!mobile 603HW.